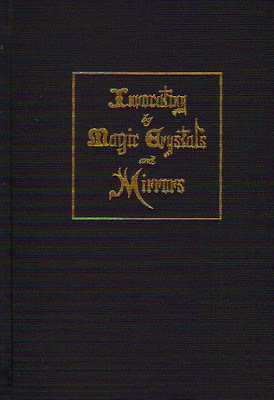 "Invocating by Magic Crystals and Mirrors" contains a full color facsimile of an original manuscript by Frederick Hockley, a transcription of the text, an Introduction by R. A. Gilbert, and other related material. Frederick Hockley (1809-1885) was an important figure in nineteenth-century occultism. He was an active "seer" who engaged in scrying, and took an interest in ritual magic, alchemy and spiritualism. His work was posthumously used by various members of the Hermetic Order of the Golden Dawn. He is known for the manuscripts he created: carefully prepared copies of numerous grimoires and other magical, alchemical and kabbalistic texts from private collections around England. He also compiled a number of his own magical texts, as well as keeping detailed records of his many scrying sessions. "Invocating by Magic Crystals and Mirrors" is one of Hockley's own writings. In it he describes the philosophy and method of "crystallomancy" ("crystal gazing" or "scrying through crystals or mirrors"), a practice which has long been associated with ritual magic. It is a short work, that is reproduced from an original manuscript, dated 1869, that he presented to Barbara Honywood, a well-known society Spiritualist of the time. Honywood was said to have mediumistic powers, and it seems likely that Hockley prepared and gave the manuscript to her in the hope that it would persuade her to act as his "seer." In addition to a full color facsimile of the beautifully decorated original manuscript, it includes a typeset transcription, a fascinating Introduction by Hockley scholar R. A. Gilbert, and the text of the "Invocation of the Crowned Angel," a related work taken from Hockley's manuscript records of his personal scrying activities.